Let’s get one thing straight; this is not a morbid piece of writing. These are the truest life facts we’ll all universally encounter and here they are: I’m going to die. You’re going to die. The strangers who cut you off on the freeway or held the door open for you at the grocery store will die too. Our pets, family, friends, loved ones and others once familiar but now forgotten faces will one day no longer physically be here on earth. While we’re all headed for the great beyond, how we get there isn’t always the same. Instantaneous or drawn out, at home or in a hospital, surrounded by loved ones or alone, we each have our preferred way of departing, but more often than not, we don’t always get what we want. 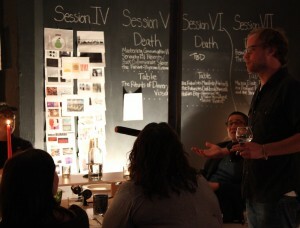 Questions about death were the centerpiece of conversations this quarter in the MCDM course, The Table of Truth: Re-imagining the Dinner Table as a Digital Media Storytelling Tool. With 80% of American healthcare dollars spent on the last two years of a person’s life, this is the most important conversation the United States is not having. Our main question for the quarter was simply, how do you want to die? Suddenly, a snap judgment answer, “At home, Notebook style,” got a little more complicated. The Table of Truth was dreamt up by MCDM Associate Director Scott Macklin and Fellow Michael Hebb. This seven-student class has met every Wednesday from 6-9 p.m. at the fabulous [storefront] Olson Kundig location in Pioneer Square during the Fall quarter. The purpose of this class is to investigate the future of the table and its relationship to digital media. The physical Table of Truth is a forceful piece that digitally records, captures, inspires, and transmits the stories we tell around it each session. Our topic of discussion for the quarter could have been anything, but wisely Hebb and Macklin chose to push our boundaries by asking us to talk about an American taboo – death; in the belief that talking openly is the only way to create real change. Let’s Have Dinner and Talk About Death is a blooming non-profit stemming from The Table of Truth. Let’s Have Dinner and Talk About Death is on a mission to design a platform that will invite the general public to gather the people they care about to have a dinner in which discussions explore end of life topics. The Table of Truth is just the physical structure to help catalyze these conversations; any table can become a table of truth. The future home and class location for next generations of the table lies at The Hub Seattle where work with California’s Hub San Francisco will commence. Both Hub Seattle and Hub San Francisco are co-working and event spaces meant to inspire people and their ventures for good. It’s “where change goes to work” and sounds right up The Table of Truth and Let’s Have Dinner and Talk About Death’s alley. Outside of class we’ve read from Aristotle, Greek symposiums, and how to properly execute a dinner party with refined etiquette according to Robert Farrar Capon. We’ve spent a fair amount of time musing over Jae Rhim Lee’s Mushroom Burial Suit TED talk. (If you think you’re eco-friendly, check her out.) We’ve heard from the brilliant minds of poet Kate Lebo, author of Rest in Pieces: The Curious Fates of Famous Corpses, Bess Lovejoy, local palliative care and oncologist physician Anthony Back, headstone artist Greg Lundgren, and many more. A major partner for Let’s Have Dinner and Talk About Death is Alexandra Drane, who gave both a tear-jerking and heartwarming TEDMED2010 talk about discussing death and death care with family. 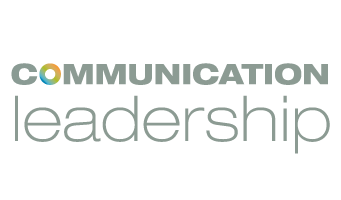 More links and resources from our classroom activities can be found on Michael Hebb’s Learnist page. 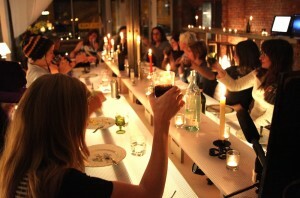 But with all of our immersion into death, which is just as much a conversation about life, our most rewarding class experience came on All Hallows Eve, where our Olson Kundig table was opened to our friends and family as we prepared dinner for our very own communal discussion. We served an escarole, persimmon and almond salad with fabulous feta cheese crumbles; taro, turnips, romanesco and onions; a vegetarian tamale with cherry tomatoes and oregano and a chicken sausage and chipotle tamale both covered with a complimenting pumpkin seed mole. For dessert (because you can’t come this far into a meal without dessert), Mexican hot chocolate and ladyfinger cookies were snacked on. Add to that, we cheered and crushed cups of wine, maybe 6-8 bottles worth, and Bassano del Grappa. If you didn’t get your tuition’s worth from this class, I don’t know where you would. 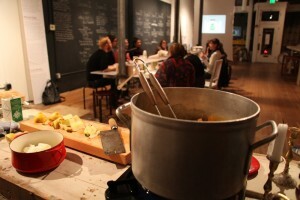 A delicious meal aside, the point of this dinner was to express ideas with people from our networks and communities. We each opened a vein of vulnerability that night and expressed deep emotions and personal feelings around death. Paradoxically, death iconography, sugar skulls, television shows like Dexter and The Walking Dead, to zombie apocalypse video games and movies have become pop-culture norms, yet not only are we afraid of death tapping us on our shoulder, but we’re afraid of talking about it, too. At our Halloween dinner, a major conclusion to take away from the night was that when people die, they would like it to be fast, preferably while they’re asleep without feeling any discomfort. People were very worried about suffering either in their last moments or by watching a loved one leave. Pain and death are associated together but perhaps might be better looked at as somewhat mutually exclusive. Though our topic has revolved around death, it might really be about suffering and experiencing uncomfortable human emotions such as vulnerability, weakness, and loss of control. It seems these are more frightening than death itself. Death should be seen as a verb, it’s something that you do, just like living is what we all do too. Depending on what you believe in, dying perhaps is just drifting off into permanent, oblivious slumber-land, a step to reincarnation, or a path toward eternal happiness and joy. What’s to fear about that?